Who better to write a history of the most powerful court in the world from its meager and penniless beginnings under President George Washington than a seasoned author who also served honorably in those hallowed chambers for a quarter of a century? 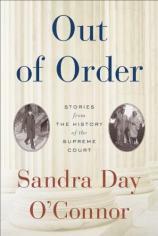 "OUT OF ORDER is an informative and entertaining book of 163 pages.... O’Connor has unobtrusively footnoted all references for the discerning reader, but this is a highly digestible read for any political junkie, history or constitutional buff." Perhaps one of the more intriguing bits of history was how humble the beginnings of these judges were. In our lifetimes, our view of the austere lineup of robed men and women is one of nine somber, forbidding monk-like scholars, pondering great thoughts and sending down life-altering pronouncements from on high like the words of a chorus of oracles. However, this is not how the court conducted itself in its first 140 years. It began as a group of six judges, nominated by the sitting President and confirmed by the Senate, whose job it was to “ride circuit” in the first 13 states. These districts expanded greatly over a century and almost a half as the nation grew. They did not convene in a stately building to adjudicate over cases that were decided in the far regions. Lawyers who wished to appeal a local decision did not come to the nation’s capital to plead for a ruling by the high court in a comfortable courtroom. If a decision needed a constitutional opinion by the higher court, the justices of the Supreme Court quite literally climbed on a horse or, if lucky, a horse-drawn carriage and traveled in a predetermined route throughout their district, meeting on site to review cases. This circuit riding occupied a minimum of six months out of their year, and although for a brief period of time in the early 1800s it was halted, Congress reinstituted it because they felt it was important that the justices stay in touch with the people their decisions affected. Not surprisingly, there was a sizeable turnover in the ranks of the Court because the dangers and rigors of travel in the 18thand 19th centuries imposed a grueling toll on the judges’ health and disruption of their families. In the early days, when they did return, it was to a spare hearing room, often shared with other local officials. The name Sandra Day O’Connor will go down in the history books with other notable justices of the Supreme Court as the first woman to be seated among that pantheon of legal minds. In July 1981, President Ronald Reagan nominated O’Connor and saw a unanimous vote in the Senate to seat the first woman, who would serve for 25 years. 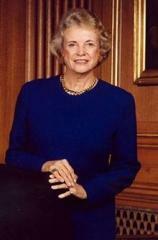 During her term, she would hear and render opinions on thousands of important constitutional subjects, some of which would come as a surprise given her apparent conservative background. OUT OF ORDER is an informative and entertaining book of 163 pages. As a bonus, it includes an addendum copy of the Declaration of Independenceandthe Constitution, including all 27 amendments. O’Connor has unobtrusively footnoted all references for the discerning reader, but this is a highly digestible read for any political junkie, history or constitutional buff.